Joules Angstrom – Joules Angstrom’s focus is to increase the productivity and profitability of our customers through our recognition of your needs, first and foremost. Joules Angstrom’s focus is to increase the productivity and profitability of our customers through our recognition of your needs, first and foremost. A company built on technical excellence and application of that knowledge to serving customers. 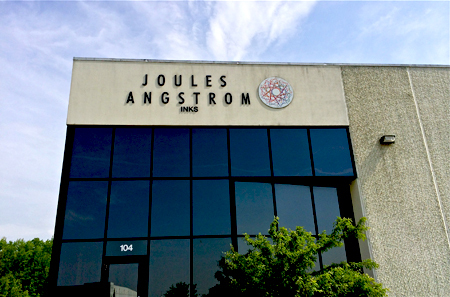 Joules Angstrom UV Printing Inks was founded in early 1999 when Patrick Carlisle recognized unmet needs in the UV printing ink marketplace. He addressed this by creating a company completely focused on Energy Curable Customers and their ink requirements. The company was built on technical excellence and application of that knowledge to serving customers. Our measure of the market's acceptance of this strategy is the response of our customers. As a result, we are privileged to have excellent and dynamic working relationships with printers from all sectors: commercial, packaging, and specialty. The company is well-positioned to serve customers in all locations. Our primary manufacturing facility is located in Pataskala, Ohio (just outside Columbus). Our Customer Service Center is located in Chicago, IL. This center is supported by our branch locations in Chicago, Minneapolis, Dallas, and Los Angeles.